Columbia Md Hair Salon / Extension Fantasy | Best Salon and Spa in Columbia MD! Admit it. You’ve got a hair fantasy you’ve never shared with anyone! Well, now you can. In fact, we’d love to hear it. Through the miracle of hair extensions, you CAN have that hair fantasy everyday. What’s important with any fantasy is to have it live up to your expectations. To do that, make sure your hair extensions are real hair, not synthetic. Don’t be afraid to spend the money on quality. It’s money and time that will pay you back. 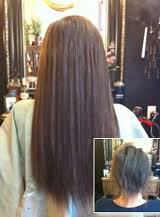 Synthetic hair extensions don’t look natural and heated styling tools will literally melt them. With human hair, the sky’s the limit! We make sure to match your hair color. This is critical! You don’t want a “mix and match” look. Hair color must look smooth and natural. You can rest assured we will choose the right shade for a flawless look. If you’ve got very short hair and want it longer, don’t go overboard on length to start. Make sure you can manage your new tresses. We can give you additional styling tips so that you can create an abundance of different looks. Just like any fantasy, you want to keep it fresh. And with hair extensions, there’s absolutely no reason why you can’t have dozens of looks to choose from. If you want to indulge your hair fantasy, it’s what we do best at Vivid Salon located in Columbia Md.! To Schedule Your Extensions !